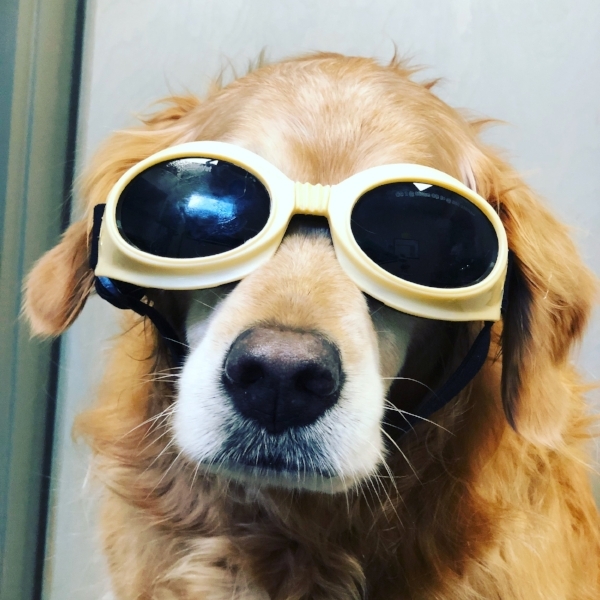 Allie has on her goggles to protect her while she gets laser therapy for her arthritis. Therapeutic laser is applying light energy to the body to stimulate healing. The word “laser” originated as an acronym for light amplification by stimulated emission of radiation. Laser light is different from “normal” light because it is of a single wavelength and it is focused (concentrated). The wavelength influences the biological effects of the therapeutic laser and is measured in nanometers (nm). The wavelength also determines the depth of penetration into the body’s tissues. What types of conditions benefit from therapeutic laser? Any pet with muscular sprain/strain and the resultant pain, osteoarthritis, post-operative application around incisions, wounds (stimulating and accelerating healing). Therapeutic laser reduces pain by decreasing inflammation, as well as by decreasing tissue chemicals that stimulate pain and by affecting nerve conduction. Therapeutic laser also enhances healing by increasing blood flow through the smaller blood vessels of the body, stimulating cellular activity, and increasing growth factors. In short, it reduces pain and enhances healing. Are all therapeutic lasers the same? No, Emerald City Animal Hospital employs a Class IV laser, which allows for shorter duration of treatment, that is much more effective than lower class lasers. Does my pet need to be shaved to receive therapeutic laser? Unlike therapeutic ultrasound, therapeutic laser does not require shaving the hair over the area to be treated. Therapeutic laser does not require shaving the hair over the area to be treated. How long does a therapeutic laser treatment last? Our Class IV laser treatments typically only last a few minutes, but for more chronic conditions can last longer, and multiple days, to months of treatment may be recommended. How often will my pet need therapeutic laser, and how many treatments can I expect? Most patients are treated two to five times per week for several weeks. Acute issues are generally treated more frequently but over a shorter period, while chronic conditions tend to be treated less frequently but for longer, meaning months to years.